For whatever brings you to Calgary, the Best Western Plus Calgary Centre Inn offers an unbeatable combination of value, comfort and location. With larger rooms than any direct competitor and a commitment to providing exceptional service, our Calgary hotel is continually recognized as one of the best affordable hotels in the city. Stay with us and you’ll find yourself just minutes from countless Calgary attractions and all the major venues like the Saddledome, BMO Centre, and Telus Convention Centre. Whether you’re here for a conference, concert or Calgary Stampede, you won’t find better value for a hotel this close to the action. With premium amenities like 42” HD TVs and pillow-top mattresses, you might be surprised at just how much our Calgary hotel rooms have to offer. Every morning, we’ll treat you to a deluxe hot breakfast and, when you’re not relaxing in your room, you can enjoy the range of Best Western Plus Calgary Centre Inn amenities like our indoor pool and fitness centre. If there’s one thing that guests remember about our Calgary hotel, it’s the warm, friendly service that we extend to every traveller who passes through our doors. From ensuring your comfort to helping you find your way around, we are committed to making your stay second to none. 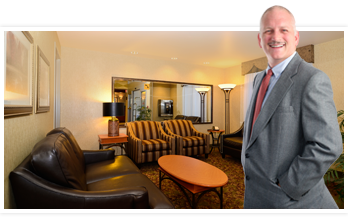 Book your Calgary accommodations today at the friendliest hotel in Cowtown.